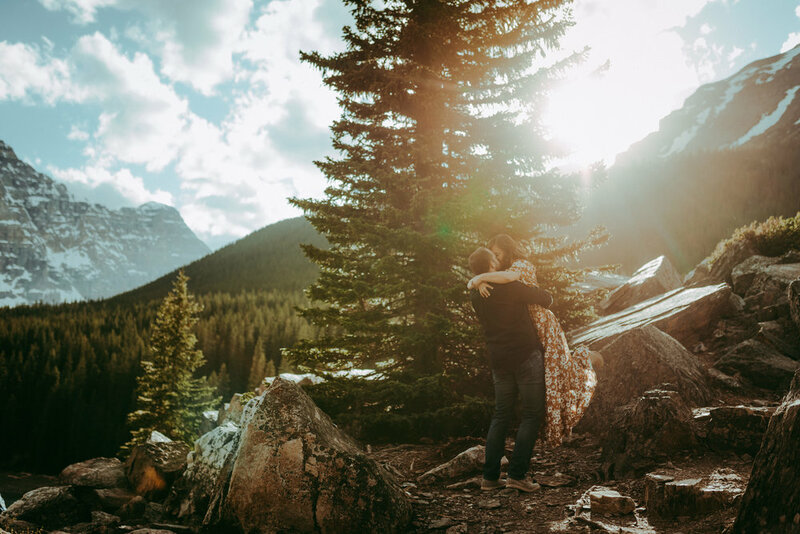 What better backdrop is there for a romantic photo session than the Canadian Rockies? With the contrast of the turquoise blue waters amidst the vast mountain peaks, there’s few places more stunning than Moraine Lake. 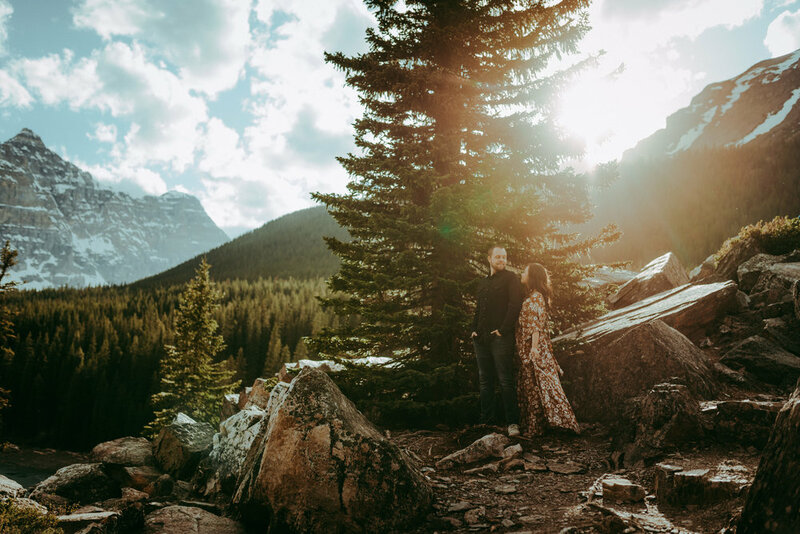 During our recent vacation, we were thrilled to work with Celestine Aerden Photography, one of the best photographers in the Canadian Rockies, who gave us some of our favorite travel photos to date that we will cherish forever thanks to her mad skills. If you’ve ever been on vacation, looked t your surroundings and thought, “I wish I had a sweet photo of us here”, but now all you have is a selfie where your eyes have wandered to the screen instead of the camera lens and your forehead looks way too big, so big it’s blocking the entire view behind you or half the shot is of your embarrassingly bright pink selfie stick- then this post is for you my friend. 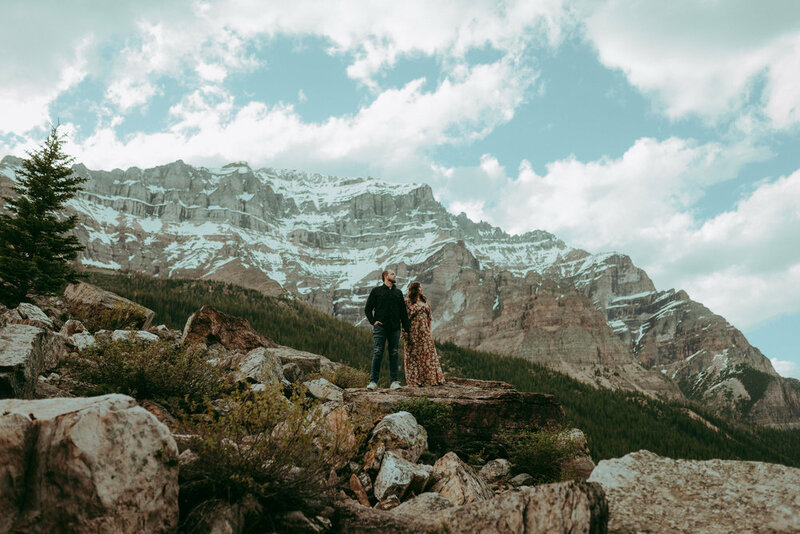 There’s no better souvenir from an incredible trip than beautiful photos that represent your time there, that will always transport you to that place and that moment, so when my husband and I began planning our vacation to Banff and beyond, we knew this would be an epic opportunity to get some updated photos taken. It’s something that I highly encourage travelers to do, especially couples who don’t have anything more recent than their wedding photos on the walls or if you plan on sending out holiday cards at the end of the year. 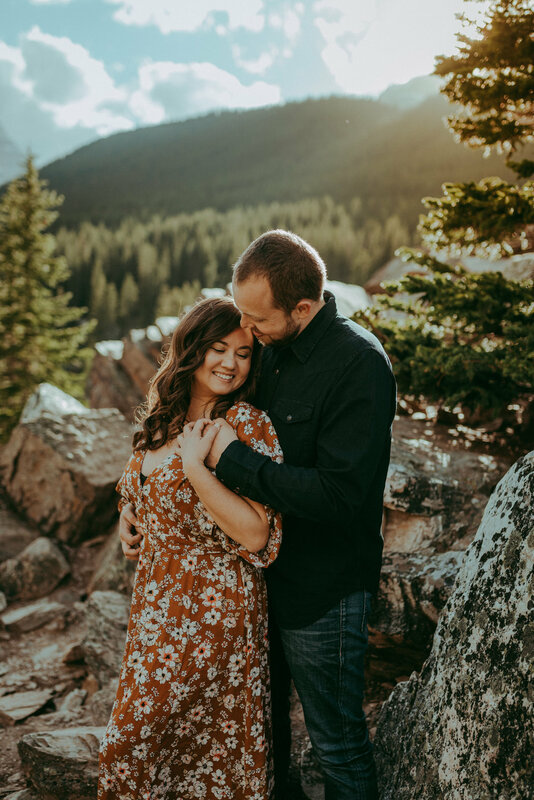 Today I am going to walk you through our photo session with Celestine Aerden Photography and my goal is to take you through the process of how to find a photographer and what to expect from start to finish. First, you have to find the right photographer that represents your personal style and is within your budget. I started my search for a photographer on Instagram, using hashtags like #canadianrockiesphotographer #albertaphotographer #morainelake. This is an excellent place to start because you’ll get a variety of example photos that will hopefully lead you to a local photographer. You can quickly learn a lot about a photographer through their Instagram shots and can rule out who meets your needs and who doesn’t. I’m looking for shots that are unposed and natural, can capture the scenery and the people equally and evoke emotion, not just a smile. I also don’t love bright colors, usually a bit more of a moody tone so that’s something that I search out as well. When I scrolled through the gorgeous photos in Celestine’s page, I knew she was what I’d been searching for. I then look through their work and if I like what I see, I continue on to their website. Most photographers will provide a pricing list, which is important because costs can vary widely from one photographer to the next, but you can usually expect somewhere from $150-350 per hour. Once I’ve found a photographer that I’m excited about and fits my budget, I contact them with my dates of availability, request a “mini session” (1-2 hours) and the specific location preference. Weekdays are usually easier to get scheduled because they don’t interfere with busy wedding weekends. Just don’t be too disappointed if your first choice is booked, just keep searching and reaching out! When I reached out to Celestine, I let her know a bit about us, what we were looking for/hoping for in our photos and any specific shots or scenery that were important to us. I felt like we would hit it off just from our email exchanges, so that already made me feel at ease, like she would get me. I guess that’s what it’s all about, finding someone that just gets you. After you’ve solidified a photographer and agreed upon a time and place, you’re ready to go shopping. Picking what you’re going to wear is essential to getting the right look and feel. It’s best to avoid thin stripes, overly matching outfits and anything too big or not flattering to your figure. It’s important that you feel beautiful and comfortable, but it’s a time to dress up in more than you would in your day to day. Accessories like hats and chunky jewelry add character to your photos, so don’t be afraid to layer on the look and add a pop of color. Just be sure to pack the perfect outfit rather than waiting to find something when you arrive - like I did in Canada as I wasted way too many vacation hours scouring stores for an eye-catching maxi-dress. Also ask your photographer if they have any recommendation, especially since they are familiar with the area. Celestine was awesome about answering my questions and ensured we had all the info we needed for a successful shoot. Now that all the hard planning is done and you’ve convinced your husband to put on a fancy outfit and actual shoes (non-sandals for once! ), the intimidating part of actually getting your photo taken is finally here. I’m someone who doesn’t really like to have my photo taken… I become all awkward and sweaty and do weird things with my face like tilting it way to far to one side and finding it necessary to cross my feet or do something equally as unflattering no matter how many times I tell myself to just stand normally! But when we were with Celestine, all of that stress and anxiety melted away and within minutes felt very relaxed as if I was just taking a stroll with a friend. That’s the gift of great photographers, they help you to feel at ease and it’s like they are there to hang out with you and just happen to be taking your photo. She started us out with an easy stroll to ease us into the process as we talked about her journey into photography and her experience being a new mom. Celestine was extremely easy to talk to and we found ourselves lost in conversation. Fun fact about Celestine - she loves photographing intimate ceremonies like elopements where just a few people share in such a special time. While we walked she would give us just little bits of direction like where she wanted us to stand or what way to turn, which was super helpful so we weren’t fumbling around aimlessly. She was also encouraging and sweet, genuine and kind - overall just a pleasure to be with, completely distracting me from our little rock climb. As we continued up this rock mountain, it was hard to know exactly where we were going or what the background was going to be like, but Celestine knew exactly what she was doing. She knew right where to place us to capture the perfect light and she would move around so that she could get the entire mountain range behind us - but we had no idea! She was like a little billy-goat, hoping around from rock to rock to get different angles. We would just kind of mosey along and she would stop us and tell us to kiss or hold hands, but when you’re standing there you don’t realize the magic going on around you. To help us switch things up get us to giggle at times, Celestine would ask us silly questions like - “Colin, tell me about your first date in your best British accent” and it was hilarious! Mainly because his British accent is an atrocious combination of Russian/German and painful to listen to. And then she would ask me about how he proposed or how I knew he was the one and I was nearly in tears. She was doing more than just getting us to laugh or smile, she was creating moments filled with real emotion between us. 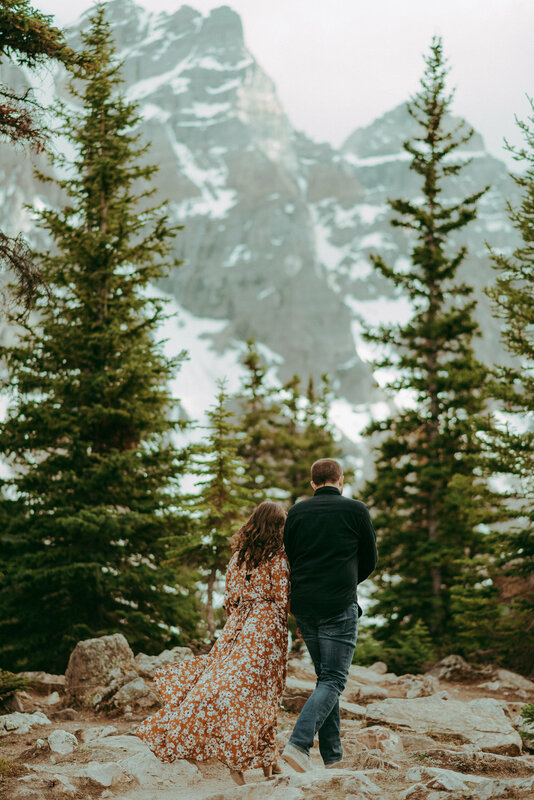 We really had a lovely time with Celestine, looking down at Moraine Lake as he whispered romantic somewhat-British nothings into my ear and starred longingly into each other’s eyes. It was easy, it was fun and it was worth it. When its all said and done, you go home and wait anxiously for your photos to arrive in your inbox. Usually somewhere from 3-6 weeks later they arrive (often as a link to your private gallery) and if you’re lucky enough to work with a photographer as talented as Celestine, you’ll have a hard time narrowing down which photos are your favorite and will have plenty of shots to last you through an entire year of #TBT on Instagram! Just remember to tag your photographer in your posts, that’s a great way to thank them for their great work. Be sure to download all of the photos to your computer or external hard drive because they won’t stay up forever and you won’t want to lose them. You should also receive a release from your photographer so that you won’t have any problems when you go to print them out. We really had a lovely time with Celestine Aerden as our Canadian Rockies photographer for the afternoon. Hovering above Moraine Lake as Colin whispered romantic, somewhat-British nothings into my ear and starring longingly into each other’s eyes, it will be an experience we will never forget. It was easy, it was fun and it was absolutely worth it. I’m so thankful that I have these memories to look back on and updated, non-wedding photos up on the walls. Be sure to check out my first-timer’s travel guide to the Canadian Rockies ﻿by clicking below.